Two-stage test vehicle consisting of 1 x Agate + 1 x P064. It was designed to test the upper stage and payload elements of the Diamant orbital launcher. These included fairing jettison, spin-up, release, and ignition of the P064 final stage. Six launches were used to validate the design and led to the success of the Diamant on its first flight. The last four launches were made on behalf of CNES to validate payloads for the D1 satellite and carry scientific instruments for the Paris Observatory and Max Planck Institute. AKA: VE210. Status: Retired 1967. 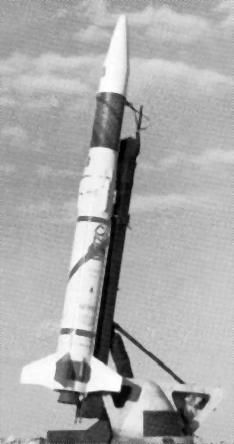 First Launch: 1964-06-10. Last Launch: 1967-07-05. Number: 10 . Thrust: 186.00 kN (41,814 lbf). Gross mass: 4,000 kg (8,800 lb). Height: 9.60 m (31.40 ft). Diameter: 0.80 m (2.62 ft). Apogee: 2,000 km (1,200 mi). Family: orbital launch vehicle. Country: France. Launch Sites: Hammaguira, Hammaguira Bacchus, Biscarosse. Stages: NA801, P6. Agency: SEREB. 1964 June 10 - . 05:30 GMT - . Launch Site: Hammaguira. Launch Complex: Hammaguira Bacchus. LV Family: Agate. Launch Vehicle: Rubis. A-1 capsule test - . Nation: France. Agency: ONERA. Apogee: 1,800 km (1,100 mi). 1964 June 12 - . 05:03 GMT - . Launch Site: Hammaguira. Launch Complex: Hammaguira Bacchus. LV Family: Agate. Launch Vehicle: Rubis. 1964 October 12 - . Launch Site: Hammaguira. Launch Complex: Hammaguira Bacchus. LV Family: Agate. Launch Vehicle: Rubis. FAILURE: Failure. A-1 capsule test - . Nation: France. Agency: ONERA. Apogee: 60 km (37 mi). 1964 December 18 - . Launch Site: Hammaguira. Launch Complex: Hammaguira Bacchus. LV Family: Agate. Launch Vehicle: Rubis. FAILURE: Failure. 1965 May 31 - . Launch Site: Hammaguira. Launch Complex: Hammaguira Bacchus. LV Family: Agate. Launch Vehicle: Rubis. A-1 capsule - . Nation: France. Agency: ONERA. Apogee: 2,000 km (1,200 mi). 1965 June 3 - . Launch Site: Hammaguira. Launch Complex: Hammaguira Bacchus. LV Family: Agate. Launch Vehicle: Rubis. 1965 June 5 - . 05:40 GMT - . Launch Site: Hammaguira. Launch Complex: Hammaguira Bacchus. LV Family: Agate. Launch Vehicle: Rubis. Rubis 01/D-1 Test/Ionosphere mission - . Nation: France. Agency: CNES. Apogee: 2,020 km (1,250 mi). Carried a D-1 satellite test experiment, a magnetosphere sensor, and a Meudon radioastronomy experiment with a 36m dipole observing at 1.8 and 2.4 MHz. 1965 September 30 - . 04:20 GMT - . Launch Site: Hammaguira. Launch Complex: Hammaguira Bacchus. LV Family: Agate. Launch Vehicle: Rubis. Rubis 02 Radio astronomy / particles mission - . Nation: France. Agency: CNES. Apogee: 1,760 km (1,090 mi). 1966 April 22 - . 20:00 GMT - . Launch Site: Hammaguira. Launch Complex: Hammaguira Bacchus. LV Family: Agate. Launch Vehicle: Rubis. Rubis 03 / MPE Ba-17 Plasma / ionosphere / barium release mission - . Nation: France. Agency: CNES. Apogee: 2,035 km (1,264 mi). 1967 July 5 - . 14:07 GMT - . Launch Site: Biscarosse. LV Family: Agate. Launch Vehicle: Rubis. Rubis 04 Astronomy mission - . Nation: France. Agency: CNES. Apogee: 1,560 km (960 mi). Radio-astronomy experiment; measured the MHz range radio background.